These photos compare motion blur between 60Hz versus 120Hz versus LightBoost / ULMB. All images below are captured from the same computer monitor. These demonstrates differences in motion blur caused by high persistence (sample-and-hold). These UFO objects were moving horizontally at 960 pixels per second, at a frame rate matching refresh rate, on an ASUS 120Hz LCD. These close-up pictures were taken using a pursuit camera at 1/30sec exposure (exposing multiple refreshes into same photo). 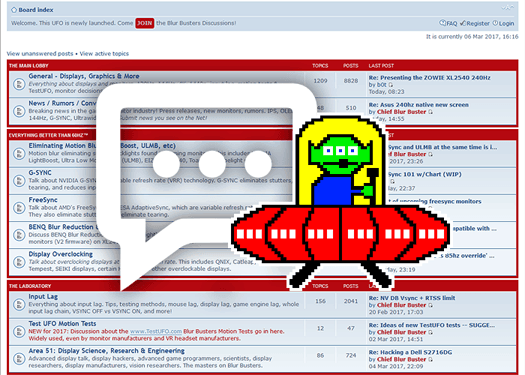 Each refresh is displayed continuously for a full 1/60 second (16.7ms). 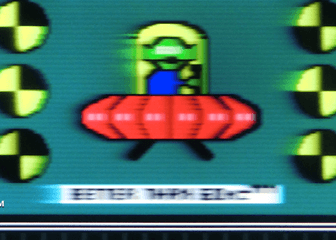 This results in approximately 16 pixels of motion blur during 960 pixels/sec motion. 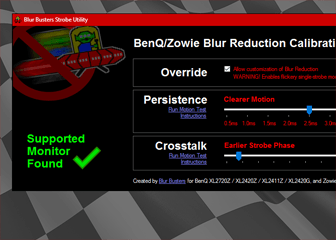 This results in approximately 8 pixels of motion blur during 960 pixels/sec motion. The backlight is strobed briefly, once per refresh, for low persistence. This results in just 1 to 2 pixels of motion blur during 960 pixels/sec motion. At [email protected], a 1/30second camera exposure captures 4 refreshes. All 4 refreshes are stacked on each other, because the pursuit camera is moving in sync with the [email protected] moving object at a 1/30second camera exposure. The brief backlight flash prevents tracking-based motion blur. 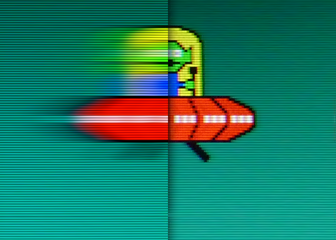 There is extremely little leftover ghosting caused by pixel transitions (virtually invisible to the human eye), since nearly all (>99%+) pixel transitions, including overdrive artifacts, are now kept unseen by the human eye, while the backlight is turned off between refreshes. See high speed video of strobe backlight, used by ULMB, LightBoost and other brands of strobe backlights. For older monitors with LightBooost, see the LightBoost HOWTO. For comparision between LightBoost settings, see LightBoost 10% vs 50% vs 100%. 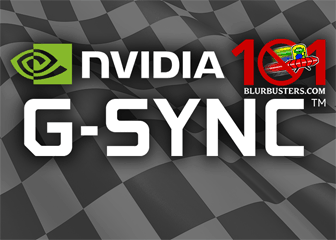 For more info, see Motion Blur Reduction FAQ and see Official List of Gaming Monitors to find which displays support Blur Reduction such as ULMB. Persistence (MPRT in ms) is not the same thing as pixel transitions (GtG response in ms). Moving Picture Response Time stands for MPRT, is also measured in milliseconds. Even a monitor advertised as 2ms GtG, can still have 16ms of persistence (MPRT). This graph illustrates the difference in motion blur between different refresh rates, including LightBoost and non-LightBoost. 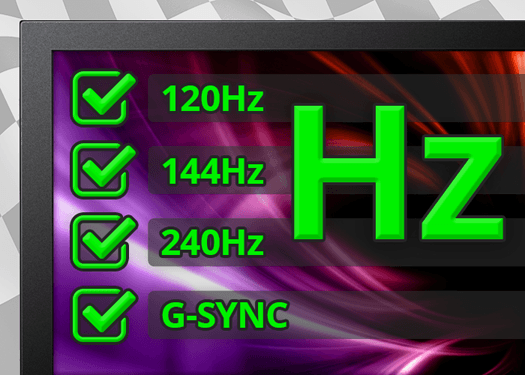 Even 100 Hz LightBoost has less motion blur than 144Hz non-LightBoost. In the best case scenario, 1.4ms is 92% less than 16.7ms — and this also accurately corresponds to the amount of motion blur perceived by human vision, and pursuit camera photography. 1ms of motion blur = 1 pixel of motion blur during 1000 pixels/sec, from the sample-and-hold effect, as demonstrated & explained at TestUFO at www.testufo.com/eyetracking. For more information about LightBoost percentages, see LightBoost 10% vs 50% vs 100%. Newer NVIDIA ULMB (Ultra Low Motion Blur) use a setting called “ULMB Pulse Width” that serves a similar function — the motion can be even clearer with shorter pulse widths. 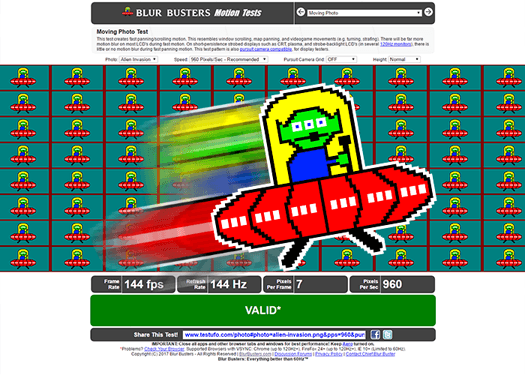 The comparison graph was created from motion tests & oscilloscope measurements, including PixPerAn and Blur Busters Motion Tests, and cross-checked with TFTCentral oscilloscope tests (for 120Hz LightBoost = 100%). Accuracy +/- 0.1ms, assumes TN panel technology with optimized RTC, motion tests done with VSYNC ON with frame rate matching refresh rate. Why Do Some OLED’s Have Motion Blur?